Busy, busy, busy! Gideon is more active than ever before, and in every area one can be active in. He not only moves nonstop, but he is learning and soaking things in like crazy. Every day he begins using a new sign, or a new word. I wouldn’t be surprised if he has a 40 – 50 word vocabulary with sign alone. I have noticed though, that he has slowed down learning signs, and is more intentional about being verbal. 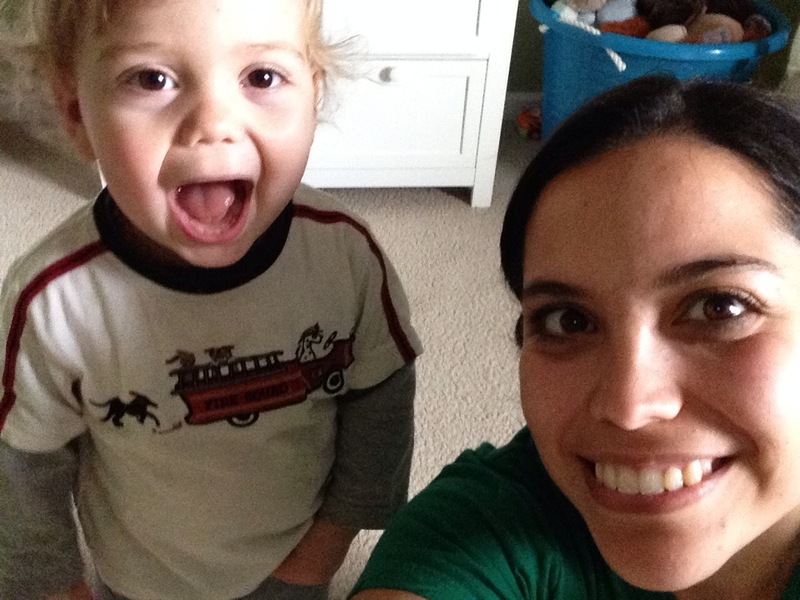 Gideon is obsessed with learning names of objects, and uses words or approximations of words consistently. He is also obsessed with poop and pee. I’m thinking he is ready to be introduced to potty learning. We’ll see how this goes. For now, we are honing in on modeling and describing things to him, so he can become familiar with the process. More on that later. Picture time! Gideon at the pet store. He loves looking at all of the animals. We have toyed with the idea of getting him a fish to take care of (feed and wipe its bowl). Gideon “counting” the little pieces in his snack bowl. One of my favorite things to do with Gideon is going to the grocery store. It’s such a great opportunity to encourage language development by naming all the produce, the meats, and using adjectives (heavy, cold, wet, etc.). Gideon is my grocery buddy. An oldie but goodie that I stole off of Daniel’s iPod. Gideon helps papi replace his toilet seat for one that is potty learning friendly. Daniel took Gideon to work for a bit today, and got to show him all the big toys! I’ve had a sore throat and aches and pains all day. Daniel has been wonderful and let me take it easy. He even made dinner and did kitchen clean up! I hope today’s restful day will help me feel better tomorrow. Gideon and I put our productive hats on this morning after Daniel left for court. I checked off a lot of the items on my to-do list, and Gideon got a lot of research done with his toys and a new (to him) Radio Flyer wagon I got for him on consignment. Daniel cut the grass after lunch while Gideon and I went for a walk. Ten minutes away from the house Gideon started nodding off, so we headed back home. He went for a nap and I got back to work. Among other things, I finally got Gideon’s pumpkin seat deep cleaned. It’s now ready to pass on to some friends of ours! The stroller was sitting there, so I went ahead and gave it a good wipe down as well. pumpkin seat and stroller cleaned, diapers prepped. Gideon woke up from his nap ready for a post-nap snuggle, followed by some post-nap selfie time. The wider the mouth, the more fun he is having. Daniel was outside planting some more trees so we decided to join in the fun. 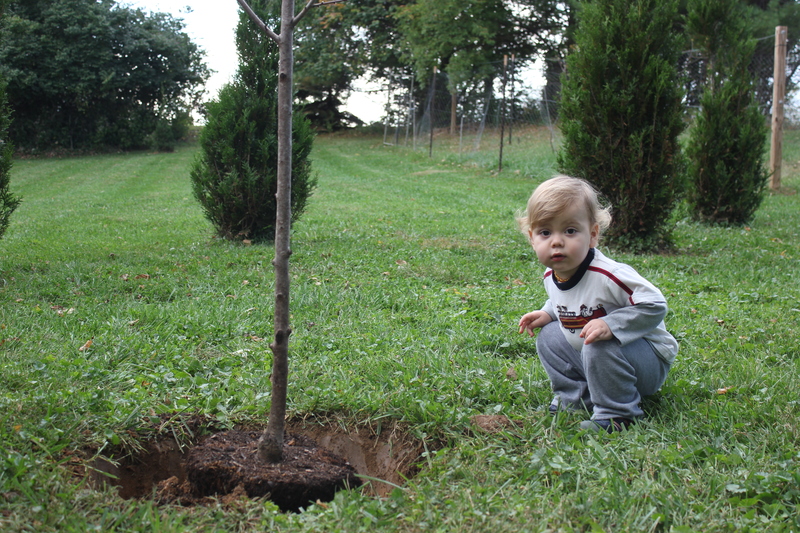 Today he planted a peach tree and a crabapple tree. We can’t wait to see these trees grow and get more beautiful! Gideon and the peach tree. “oh noo!” Gideon was appalled at the mulch spilled on the driveway. Our tiny little neat freak. We got cleaned up and had went out for dinner, followed by a visit with Daniel’s parents. A good day with lots of pictures to show for it is a great day! I don’t know what it is, but Gideon has been mass producing , well, poop. He has been getting one to to two baths a day, and I’m ready to find a solution to these poop-in-hair, poop-in-hands, poop-caking-legs blowouts. I gave him half of his nightly dose of probiotics last night and we had a blowout-free day today. So maybe that’s the key? We’ll see. Switching gears to the arrival of fall, time has come to switch out wardrobes. I thought rotating out my clothes was a daunting task. Then I had a baby. Yesterday I took a real look into Gideon’s closet to gage the complexity of the task ahead and I had to take a moment. The idea was to store clothes as the bucket filled up. Put things off much?? I do love to see his little fall/winter clothes start to peak through all the summer outfits. Tonight is labeling night. I mark all the clothes I’d like returned before I pass them on to my little nephew. Three cheers for hand-me-downs! Today was such a good day. It was gloomy and cool outside, but we were all in great moods and had a lot of fun together. Gideon slept in until 8:30, which got us both off to good starts. With plenty of rest under our belts, we hit the morning running and I got my morning routine done by 10. Gideon seems to behave better, and is better able to play on his own when distractions are at a minimum. So we enjoyed some peaceful silence without music or TV, and had an especially fun time playing and talking. My happy boy at the grocery store this morning. We’re going to have to get some kind of play kitchen for this boy. He is obsessed with kitchenware. To top off a good morning, he took a two hour nap after lunch! Gideon’s naps have been a little shorter than usual, and I really missed having that extra time to catch up on chores or have “me” time. 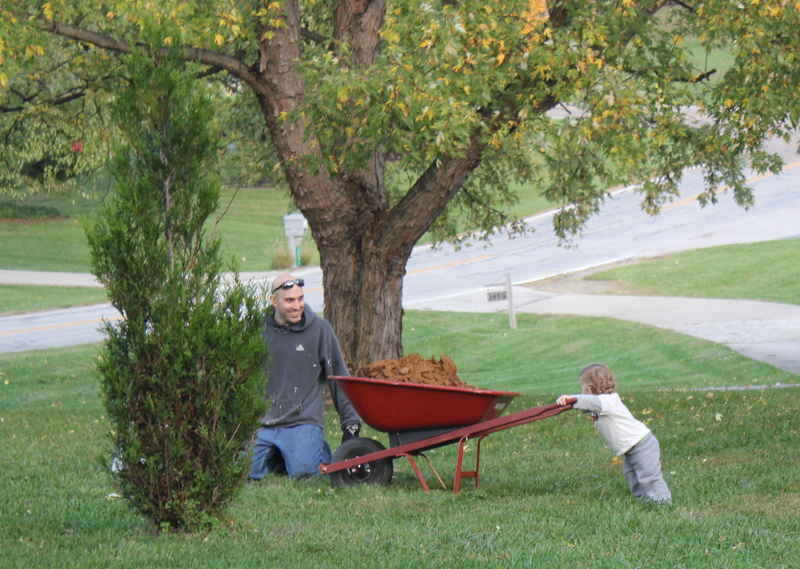 We’ve been really targeting the landscaping and privacy of our home this season, so Daniel and Gideon spent some time in the backyard planting a new juniper tree we bought yesterday. There are few things I love more than watching the boys outside working together. Gideon had his little shovel, and stayed close to give Daniel a hand. The day was going great, until I had a parenting moment I’m not so proud of. During Gideon’s bath tonight, he decided to impulsively throw a pitcher full of water out of the tub and onto the bathroom floor. Water, went, everywhere. I yelled “Gideon!” so loud and angry that he burst into tears and was so upset that he peed in the tub. I immediately knew that I’d messed up. I knew two things: 1. Gideon knows better than to throw things out of the tub and should be reprimanded, 2. I had over-reacted, and set a bad example for Gideon as we try to teach him to regulate and express his emotions appropriately. The question was, what to address first? Daniel and I are passionate and try our darndest to parent Gideon respectfully and positively. Although we fail at times, we try to always let him know what we expect of him rather than what we don’t want him to do. Explaining things to him this way seems to make more sense to him, and so is a more effective way to parent him. We try to avoid saying things like “you don’t need to cry” or “that’s nothing to cry about” or “you’re fine”, simply because we hate hearing that said to us if we are upset. The degree of severity of a situation in our minds vs. his is irrelevant. Who are we kidding? We all make big deals out of little things. What is a big deal to him should be a big deal to us, and we try to empathize with his little feelings as much as we can. My momentary loss of self-control and burst of anger during bath time tonight might have slid right of someone else’s shoulder, but for my little tot, it scared and hurt him. It was a BIG deal to him. My son had just thrown a pitcher of water out of the tub. He had not touched an outlet, ran into the street, grabbed a steak knife, or let go of my hand in the parking lot. His life and safety were not at risk here, and yet I reacted like I would have in a life-threatening situation. If the pitcher had been empty, I would have reacted better. But now I had a huge mess to clean up. Therein lay the root of my anger. I chose to apologize to Gideon first. I had wronged him, and that needed to be addressed before any further educating on “keep your toys in the tub or I will take them away”. As if my heart was not already broken enough looking at Gideon’s distraught, tearful little face as I apologized for screaming and scaring him, he let go of our hug and signed “I’m sorry”. This broke my heart rather than melt it, because I don’t think Gideon understands that he can be apologized to. He thought I was saying “Mommy’s sorry” and signing it to him as a way of cueing him to apologize to me. I took a step back and made sure he watched my facial expression as I signed and said “mommy is sorry to Gideon for yelling”. I have to believe he at least understood that I was contrite and not mad at him. Once we’d done our share of hugging and wiping tears, I picked up the pitcher from the floor and told him “keep your toys in the tub”, and then reminded him to sign “yes mommy”. And that was that. I’m so grateful for such a forgiving little boy!! 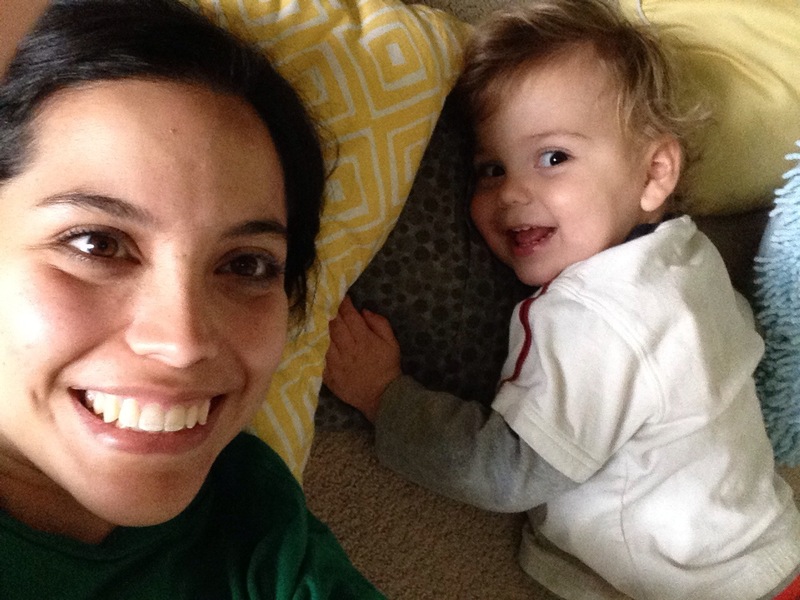 How do you deal with those moments when you get to be an apologetic parent?